The report of Wenamun has been famously been argued to be a work of historical fiction. Wenamun as a priest of Amun Ra and an Egyptian trader had a historically bad journey to the city of Byblos in around the 11 BCE under the pharaoh Ramesses XI. Wenamun was on his way to the city kingdom of Byblos where King Zakar Baal reigned. Having left Egypt to trade for the precious cedar timber of Lebanon, Wenamun goes via the port of Dor where he is robbed. The local King, Beder, says that he will find the thief and reimburse Wenamun but after a course of inaction Wenamun finds the king accusing one of his own men and thereby removing his vow of personal responsibility to reimburse the unlucky trader. The kingdom of Dor was reputedly a petty kingdom in Syria that was subject to Ramesses XI, it seems that they would shortly gain their independence and their attitudes perhaps reflective of this, at this time. On the way to Byblos from Dor the report cuts off, when it reappears it seems that Wenamun engages in an act of piracy and seizes a bag of silver going someway to recouping his loses. 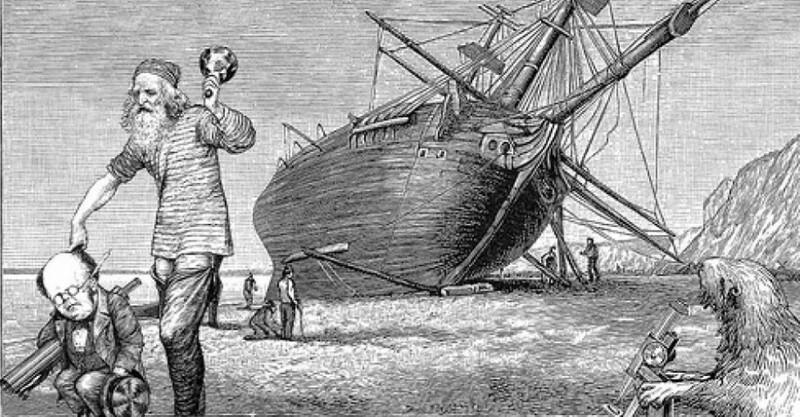 Wenamun sails on to Byblos where he is denied the customary free timber and it is at this point that shows the waning influence of Egypt in the east and confirms to Phoenician scholars the power of the Kingdom of Byblos. Egypt at this time had just expelled an invasion of the Sea Peoples, and is considered to have been significantly weakened by the war, which culminated in the famous battle of the Delta. The Sea Peoples were a mysterious force from the west, which laid siege to kingdoms in the eastern Medditerranean in circa 1175. 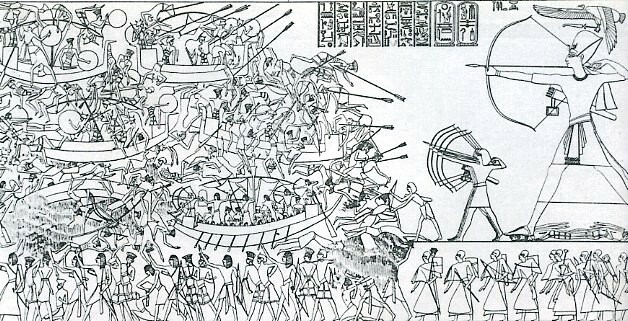 The Egyptian battle of the Delta apparently consisted of showering the invaders in their ships with fire arrows in a full-scale massacre. And so with the kingdom of Egypt in a state of decline it seems a sailor’s report (historically fictional or not) provides an insight into the changing nature of Egyptians relations as a testament to it’s waning power. King Zakar Baal denies Wenamun an audience for 29 days and only does so when a priest of Amun, an Egyptian god recognized by the king, tells of ill omens if the audience is not granted by falling into a frenzied episode of prohecy. When the king denies Wenamun the goods for free, Wenamun is forced to remain in Byblos for a year and sends to Egypt for payment. At this point Zakar Baal send for the gathering of timber and informs Wenamun that he has been treated better than previous Egyptian sailors who were kept in Byblos for 17 years and died there, when the king offers to show Wenamun their tombs, he declines. Wenamun’s report ends after a near death experience in Cyprus at the hands of a mob, his safety is vouched for by the queen, after an Egyptian interpreter is found. The report was purchased by the Russian Egyptolologist Vladimir Goleniscev in 1890 and now sits in the Pushkin Museum of fine arts in Moscow under the name Papyrus Pushkin 120. Whether the report is a piece of historical fiction or not, the times and places are deemed to be historically accurate. The report is reputedly one of the most important documents from ancient Egypt and exposes the politics in the collapse of the Bronze Age. The Sea Peoples invasion of the eastern Mediterranean and the trade agreements and hostility towards Wenamun all speak of the waning of Egyptian power. The document is regailed as an important testimonial to the power of the city of Byblos, not only in their trade but also in their administration.